Is it a river? A sewer? A flood control channel? A place to film awesome drag racing scenes? A tool of gentrifiers to raise property values? What's the deal with the L.A. River, and why should I care about it? Let's find out. The L.A. River is shaped like a comma. It begins in the western San Fernando Valley at the foothills of the Simi Hills and the Santa Monica and Santa Susana Mountains. It flows east, curving around Griffith Park and passing beneath the foothills of the San Gabriel Mountains before flowing south all the way to Long Beach and the Pacific Ocean. In total, the river runs for 51 miles and passes through 17 cities. Two main sources: rain and wastewater treatment plants. When it rains up high in the mountains that ring the Los Angeles Basin, the water flows downhill, first in tiny rivulets, and then making its way into larger and larger creeks. The creeks flow into each other, becoming larger and more powerful. And eventually, they flow together to form the Los Angeles River. But in the summer, when it doesn't rain in Los Angeles, the river doesn't just run dry. Instead, it's fed by wastewater discharged from three wastewater treatment plants in L.A., Burbank and Glendale. This water is typically cleaner than water that flows into the river from city streets and storm drains (more on this later). IF IT FLOWS WITH TREATED WASTEWATER DOWN A CONCRETE CHANNEL, IS IT REALLY A RIVER? I know it doesn't look like it anymore, but more than 80 years ago the river was, in fact, a legit river. Before Europeans arrived, the Gabrieleno-Tongva Mission Indians lived along the river. Tribal member Mark Acuna told KCET that back then, the L.A. Basin was lush, thick with "great reed forests so thick that Spanish talk about it would take days to cross through them." The river was thick with steelhead trout, which are now endangered, and the forests were home to bears, mountain lions and deer. WOW, THAT SOUNDS PRETTY INTERESTING. WHAT HAPPENED? Europeans showed up. Spanish colonists founded the Pueblo of Los Angeles along the L.A. River in 1781, and it was the primary water source for the growing city until 1900. Over time, people built homes closer and closer to the river's banks—dangerously close, because the L.A. River can grow from a trickle to a raging torrent in just a few hours. And that's exactly what it did in February 1938, after it rained more in a single day than it normally did in a year. The river surged beyond its banks. It took out bridges. It took out houses. It flooded Echo Park and Venice and surrounded Warner Brothers Studios like a moat. According to the L.A. Times, "so many Hollywood stars were stranded at their ranches in the Valley and elsewhere that the Academy Awards presentation scheduled at the downtown Biltmore Hotel was postponed for a week." At least 96 people died, and more than 1,500 homes were destroyed. The flood marked the end of the river being a river. Afterwards, the dam-building, river-righting men at the US Army Corps of Engineers began encasing the river in a deep concrete channel that would keep it from spilling out of its banks during future floods. They erected fences and put up "No Trespassing signs." It took 20 years and 3.5 million barrels of cement, according to "The Los Angeles River, Its Life, Death and Possible Rebirth," but by the end the the river had been erased, transformed from an ecosystem into a freeway for moving flood water efficiently and safely from mountains to the sea. SO WHEN DID THE RIVER BEGIN TO COME BACK TO LIFE? In 1985, a writer named Lewis McAdams took a pair of wire cutters and two friends down to the river and cut a hole in the fence. According to the non-profit he founded, Friends of the Los Angeles River, "Lewis and two friends, whiskey in their blood and wire cutters in their hands, cut a hole in the surrounding chain link fence that had defined the river as an inhospitable drainage ditch. With one fell snip, MacAdams declared the L.A. River "open for the people." 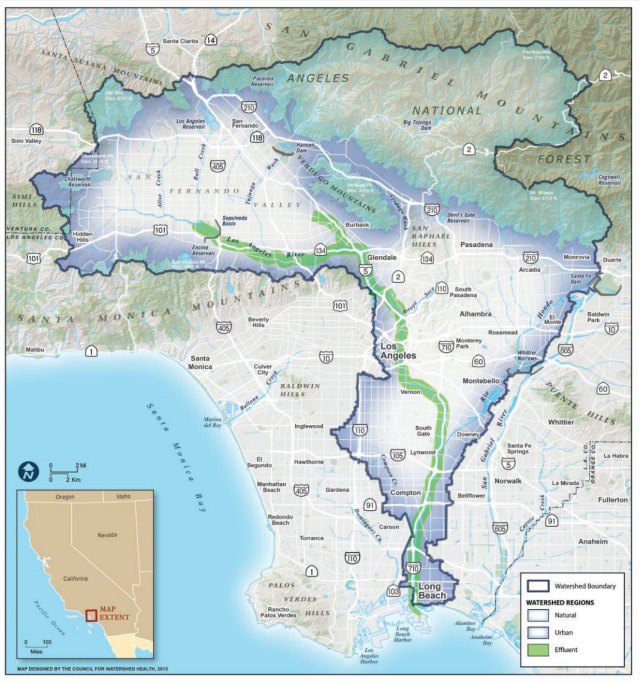 McAdams began advocating for the restoration of the river, and in 1997, L.A. County produced a master plan outlining how exactly that would happen. That same year, the first stretch of bike path opened in the Elysian Valley section of the river. But the US Army Corps of Engineers argued that the river wasn't safe for people, except in two small sections. In response, satirical writer George Wolfe and a rogue Army Corps biologist, Heather Wylie, decided to kayak the entire thing, to prove the Army Corps wrong. They set out from Canoga Park in July 2008 and reached Long Beach three days later. Former LAist photographer Tom Andrews documented the entire thing. The crazy stunt worked: two years later, in 2010, the EPA declared the entire river to be "traditional, navigable waters," overturning the Army Corps' decision. And in 2011, the river finally opened to kayaking, for the first time since it was put into its concrete channel. SO CAN I KAYAK THERE NOW? Yes, but only in two sections of the river: Elysian Valley, from Fletcher Drive to Steelhead Park (which is just off Oros Street in Frogtown), and in the San Fernando Valley within the Sepulveda Basin Recreation Area, from Balboa Boulevard to just west of Woodley Avenue. The Lower L.A. River may one day be open to kayaking, but right now it's closed. Kayaking is allowed from Memorial Day through September 30, 2018, only in Elysian Valley and the Sepulveda Basin. You can't kayak the river any other time, or any other place. CAN I TAKE MY OWN BOAT OR DO I HAVE TO GO WITH A GUIDE? You can take your own kayak, rent one, or go with a guide. L.A. River Expeditions runs guided trips in both Elysian Valley and Sepulveda Basin. L.A. River Kayak Safari runs guided trips in the Elysian Valley only. And L.A. River Kayaks will rent you a kayak in Elysian Valley only. CAN I TAKE A GIANT PINK FLAMINGO DOWN THE RIVER? Sadly, no. Only "non-motorized, steerable boats such as kayaks or canoes" are permitted. The three guys who paddled down the section of the river that flows through Vernon in a pink inflatable flamingo in March 2018 broke all the rules: wrong season, wrong place, and wrong type of boat. It was pretty awesome, though. WHAT SORT OF WILDLIFE MIGHT I SEE ON THE RIVER? There are a ton of birds that live in or visit the L.A. River, including the iconic great blue heron, which lives in huge, tree-top nests in riverside neighborhoods. 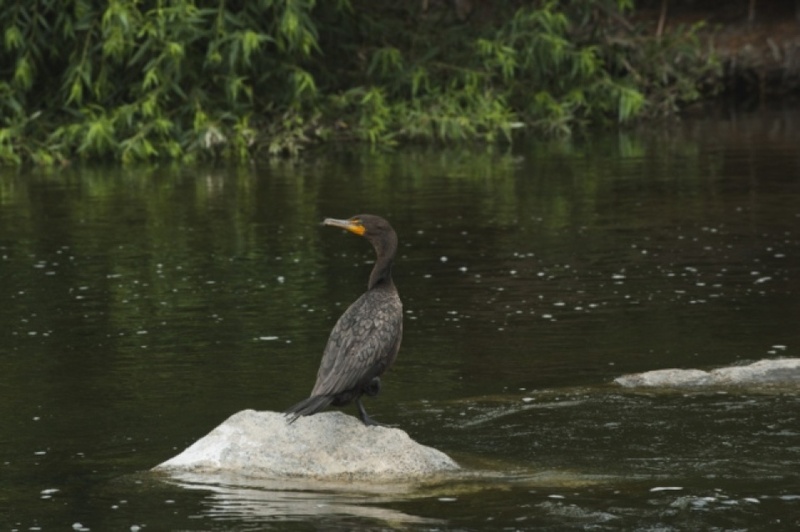 The birds you'll see depend on where you are on the river, as Kimball Garrett of the Natural History Museum told KCET. In the parts of the river that are soft-bottomed, meaning they aren't completely lined by concrete, you'll see a lot of duck-like species like mergansers, buffleheads and grebes. But in the completely channelized sections, where the water is shallower, you're more likely to see sandpipers and other long-legged waders. There's also a lot of fish — mosquito fish and tilapia are the most common, but you'll also see huge carp, fathead minnow and green sunfish. The National Park Service is conducting a study right now to better answer the question of what mammals live along the river NPS installed 39 camera traps, which take pictures when they detect motion and heat, along the L.A. River from its headwaters in Woodland Hills to south of downtown. The cameras have already captured photos of coyotes, bobcats and deer. You can watch a cool time lapse that KPCC made of a previous monitoring project back in 2015. CAN I FISH IN THE RIVER? AND CAN I EAT THE FISH I CATCH? Yes, you can fish in the river — just get a state fishing license. As for eating the fish, it really depends on who you ask. "It's an enter at your own risk situation," said Marissa Christensen, the executive director of Friends of the L.A, River. "It's a personal choice," said Fernando Gomez, a river ranger for the Mountains Recreation and Conservation Authority (MRCA), but "folks have told me they're really good eating." "It would not be a good idea to eat them given what we know about pollution levels," said Melissa Von Meyerhauser with L.A. Waterkeeper. "I see a lot of people doing catch and release. That's the safest choice." HOW CAN I STAY SAFE WHILE KAYAKING THIS RIVER? Just cause it's legal to kayak the river doesn't mean it's always a good idea. The Army Corps of Engineers closes the river for up to 72 hours after a rain, when the concrete channel fills to the brim with raging flood waters (this is why the channel was built in the first place, remember)? The river is also closed when E.coli bacteria levels are high enough to make you sick. You can check the levels on this brand-new website. Red means the riverbed is closed: no kayaking, wading, or otherwise getting in the water is allowed. Bacteria levels are at least twice the federal safety limit. Yellow means proceed with caution. Bacteria levels are up to twice as high as the federal safety limit. Green means go! Bacteria levels are below the federal safety limit. But there's still NO SWIMMING allowed. Even if bacteria levels are within federal safety limits, try to avoid touching the water or getting it in your mouth. Ingesting E.coli can cause diarrhea, vomiting and fever. SPEAKING OF WATER QUALITY: HOW DIRTY IS IT? 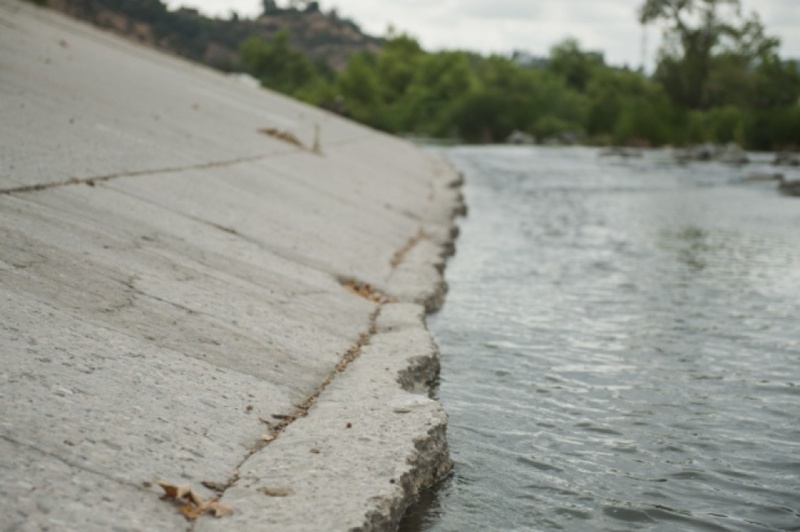 Last year, E.coli bacteria levels in the river exceeded standards meant to keep swimmers safe 28 percent of the time in Elysian Valley, and between half and a third of the time in the Sepulveda Basin, according to data collected by the Council for Watershed Health. While bacteria is the pollutant that's most likely to make you sick, it's far from the only thing sullying the L.A. River's waters. There are 21 different pollutants that violate federal standards, including: ammonia, metals, trash, algae, oil, pesticides, insecticides and a number of volatile organic chemicals. WHAT ARE SOME OF THE CRAZIEST THINGS PULLED OUT OF THE RIVER? "We have not found dead people as of yet, luckily," said Melissa Von Meyerhauser, the watershed programs manager at L.A. Waterkeeper. But she has found trampolines, rolled up carpets, a dirt bike, 1980s-era computers, flip phones and lots and lots of shopping carts. 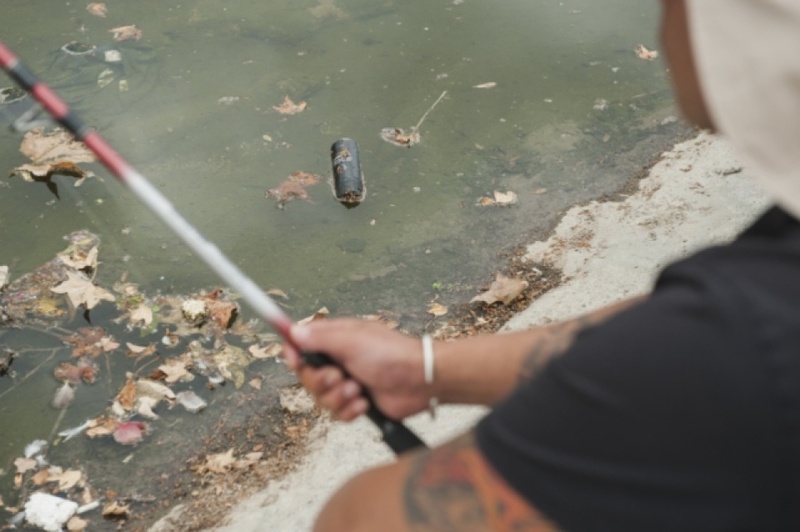 "The river is really a reflection of our society, especially in terms of the trash that we find." "Every once in a while we take something home as a treasure from the river," said Marissa Christensen, the executive director of Friends of the L.A, River, which runs annual river clean ups. Her favorite is, "a gold, ceramic figurine with a bunch of goats climbing a mountain. It's really kind of random, but cute." WHO'S IS IN CHARGE OF CLEANING UP THE RIVER? Getting anything accomplished on the L.A. River is a challenge, because there are so many different cities and government agencies with jurisdiction. In addition to the 17 cities the river passes through, there's also five additional county, state and federal agencies, plus some others we probably forgot. "It's like lasagna," said Fernando Gomez, a river ranger for the MRCA. "You've got multiple layers of entities interested in the L.A. River. Everyone wants to have a say." That said, the Los Angeles regional branch of the State Water Resources Control board ultimately has the responsibility for bringing the river into compliance with the federal Clean Water Act's water quality standards. But sadly, "we are not close. We are still pretty far away (from meeting the standards), and we don't have the resources that we would like," said Heather Repenning, the vice president of the city of LA's Board of Public Works. Because the pollution comes from so many different sources. Most of the gross stuff flows into the river from city streets and some 2,000 storm drains. LA's concrete jungle contributes to the problem: with 60 percent of the river's watershed paved over or developed, contaminated water can't be absorbed into the ground, so it runs off into the river. Many of the solutions to the pollution problem involve making the L.A. basin more porous. "Really what you have to do is take out pavement and let the water fall where it lands when it rains," said Repenning. "It percolates and it goes into the soil," where it's filtered naturally before entering the groundwater or the river's water table. 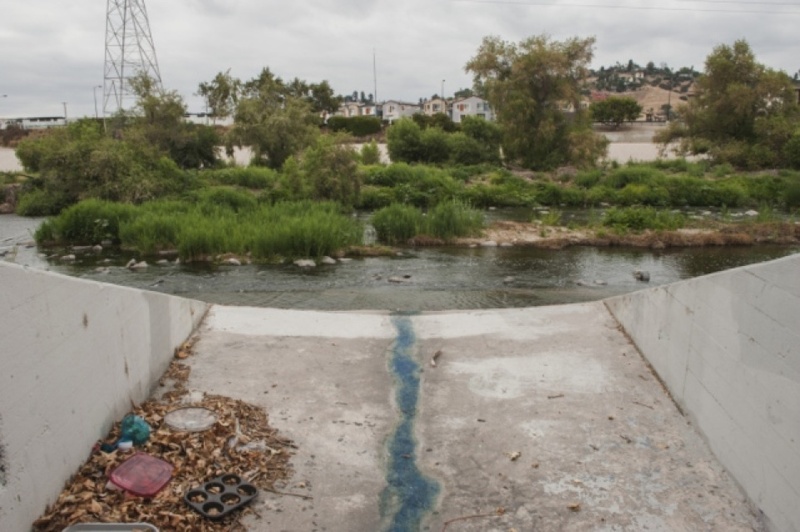 IS RESTORATION OF THE L.A. RIVER LEADING TO GENTRIFICATION? Causation is really difficult to show, but the two things do seem to be happening at the same time. Robert Garcia, the head of the City Project, found that the percentage of non-Hispanic white people has increased dramatically from 2006 to 2016 in neighborhoods near the L.A. River in Northeast L.A., where most of the revitalization efforts are directed, even though the county itself has gotten less white over that same period. "We found dramatic increases in the percentage of non Hispanic white people and dramatic decreases in the percentage of people of color who live in those neighborhoods," he said. This is bad news, Garcia says, because revitalizing the river has the potential to improve the lives of everyone leaving nearby by lowering urban temperatures through the planting of trees, providing clean, safe places to exercise, and providing the mental health benefits of being outside in nature. LEVEL WITH ME HERE: WHY SHOULD I CARE ABOUT THE L.A. RIVER? IS IT JUST A WEIRD, LOCAL CURIOSITY? OR DOES IS IMPACT MY LIFE? If you live in cities along the 710-corridor like Maywood, Huntington Park, Bell Gardens, Lynwood or Compton, a restored L.A. River is probably the best chance you have for adding parks and greenspace to your community. And parks and open space have huge public health benefits. But bringing back the L..A River is also a way to combat L.A.'s culture of forgetting and erasing our history. As nature writer Jenny Price put it 17 years ago. "What makes the L.A. River so peerlessly amazing is that its city actively "disappeared" it: We stopped calling the river a river. And it all but vanished from our collective memory. ... 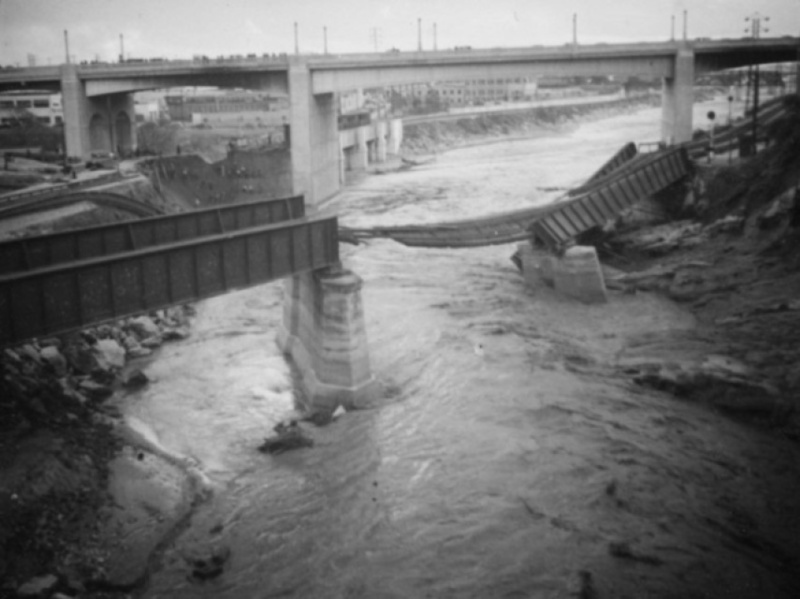 This act is unparalleled: A major American city redefined its river as infrastructure; decreed that the sole purpose of a river is to control its own floods; and said its river now belongs in the same category as the electrical grid and the freeway system and will forthwith be removed from the company of the Columbia, the Allegheny, the Salmon. In a city with a notorious, extreme tendency to erase both nature and history, L.A.'s ultimate act of erasure has been not just to forget but to deny that the river it was founded on runs 51 miles — 51 miles! — right through its heart."